Laura Kirby-McIntosh, president of the Ontario Autism Coalition, speaks at a news conference at the Ontario Legislature in Toronto on Nov. 12, 2018. 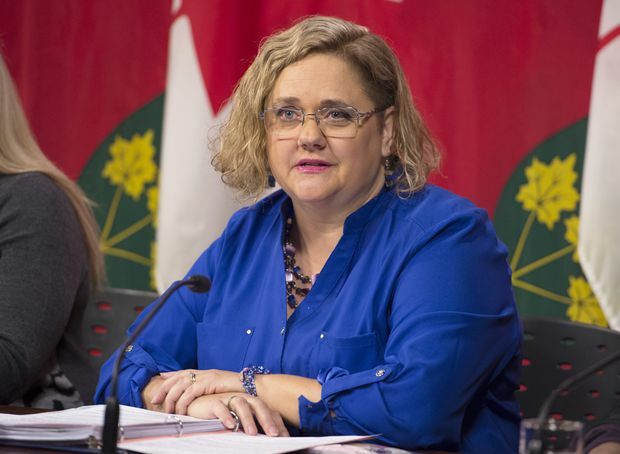 “What is the Ford government going to do to rein in the excessive, unfair and arbitrary power of school principals to exclude students from school?” OAC president Laura Kirby-McIntosh asked. “We just can’t leave the status quo in place,” said AODA Alliance chair David Lepovsky. Luke Reid, a lawyer at ARCH Disability Law Centre, said there is no formal legislative or policy limit on how long exclusions can last, and that there is often an absence of due process. “It’s sort of the Wild West in some ways,” he said. Ms. Kirby-McIntosh added there was “an appalling lack of data” chronicling the frequency at which such exclusions are occurring. “Each principal is essentially allowed to be a law unto themselves,” she said. “We are not saying principals are bad people. They are working with an antiquated funding formula, a shortage of qualified staff and an increasingly complex student population." Sam Hammond, president of the Elementary Teachers' Federation of Ontario (ETFO), said he agrees that long-term exclusions are “extremely problematic,” and endorsed the idea of a stakeholders meeting. The ETFO has been calling for an increase in direct funding for students with special educational needs, he said. "I say this with all due respect to parents of autistic children and autistic children: What are teachers and administrators supposed to do when they have gotten to the end of the supports and the resources that are available to them?” Mr. Hammond asked. The OAC and the AODA Alliance didn’t ask for additional resources Wednesday; Mr. Lepovsky said that “especially in the current economic situation and the current discretions in terms of funding,” he thought such a request would slow down their potential progress. “This government’s got fiscal constraints. It’s not a big expenditure to just get us to the table and get us talking, and for them to listen. And it’s not a big constraint to impose the policy directive," he said. The Ontario Principals' Council disputes the idea that decisions on exclusions are made exclusively by a principal, and says it has logged an “unfortunate increase” in incidents involving violent or aggressive student behaviour in recent years. It said on Wednesday that exclusions were used only after other strategies proved unsuccessful.